Stalin had no sisters (or brothers). 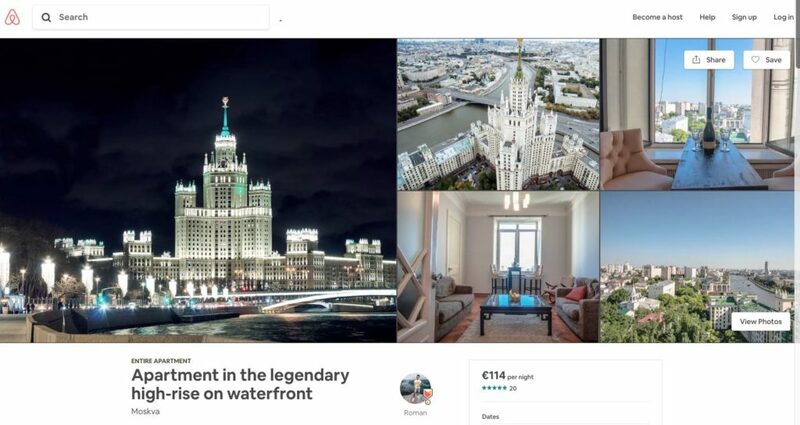 However, one of the legacies that he left were his “Seven Sisters”, which are seven skyscrapers built to commemorate the 8th Centennial of Moscow, that you will inevitably see if you visit the city. At present, they house a university, two hotels, two ministries and two residential buildings. In this article I’ll explain how to visit some of them and get to know some of their secrets. Since childhood I have always been impressed by Moscow’s skyscrapers and their imposing height. Though they all seemed the same to me, with age I discovered the different stories that surrounded each one of them. 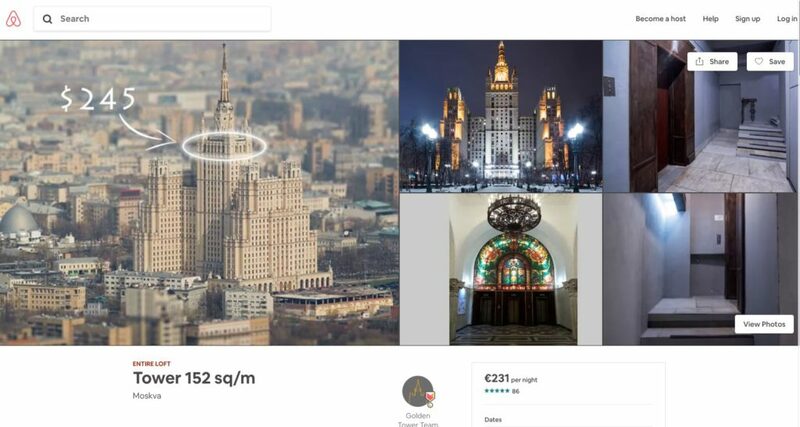 Perhaps you may have not heard of Stalin’s skyscrapers, but if you visit Moscow it will be impossible for you not to see them, since they are popularly known as the Seven Sisters, and they measure between 134 and 240 meters in height. It is a set of seven mega constructions built in Moscow between the 40s and 50s to commemorate the 8th Centennial of the city (in 1947). They combine the Russian Baroque and Gothic styles with the neoclassical one, with influences from the New York skyscrapers of the 30s, and keeping also the Soviet realist art in the facades and ornamentations. 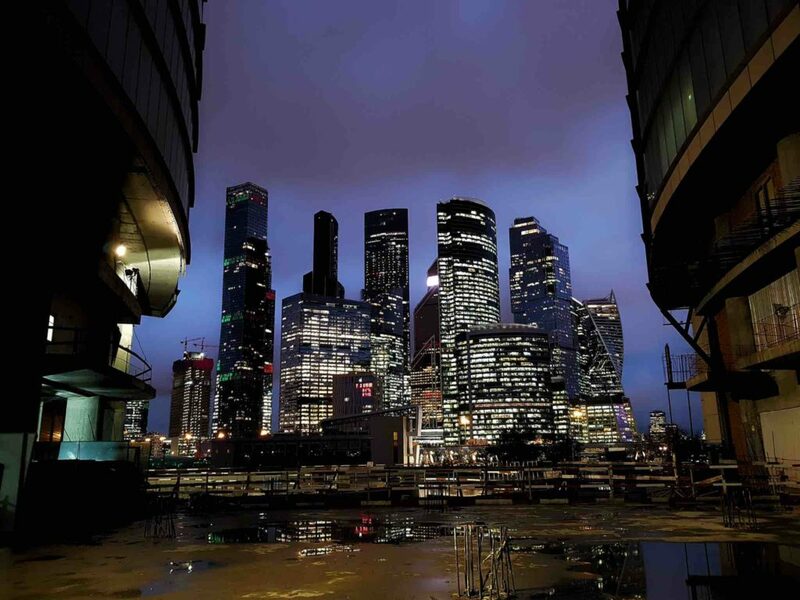 It has nothing to do with the modern-day skyscrapers located in the Moscow International Business Center. The Seven Sisters are located in different parts of Moscow and are currently headquarters for a university, two hotels, two ministries and two residential buildings. 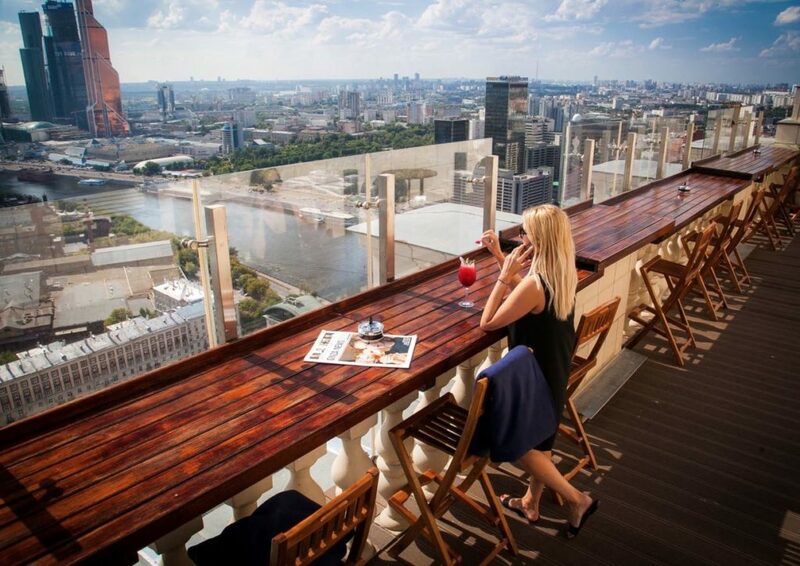 Pay the entrance to go up to the observation platform of the Hotel Ukraine (1,000 rubles). The Zaryadye administrative building, in which from 2017 you can find one of the most modern and fabulous parks in the world. The Seven Sisters can be seen from many places in the capital and the main towers stand out for their pointed finishing. In addition, in the facades you can appreciate the symbols of the era, such as the Soviet star (in all but the Ministry of Foreign Affairs), and at the same time there are varied sculptures and ornaments, proof of its splendor and grandeur. It is said that each of these gigantic skyscrapers had an underground bunker. Next to Sparrows Hill (formerly Lenin Hill) there is one of the seven most famous Sisters: the imposing building of the Moscow State University. The skyscraper of the Moscow State University can reach 240 meters high with the antenna and it has 36 floors. It is the eldest of the Seven Sisters. It was started in 1949 and completed in 1953, in an area of about 187 hectares. It was the tallest building in Europe in the 50s and until 1990, with its four large wings, which houses faculties, research centers and several teaching facilities. It is estimated that it has more than 33 km of corridors. The main tower houses a 12-ton star at its apex. The facades are adorned with giant clocks, statues and Soviet symbols, barometers and thermometers. The logo or insignia of the Moscow Olympic Games of 1980, designed by Vladimir Arsentyev, was largely inspired by the Moscow State University, a building partially remodeled in 2000. 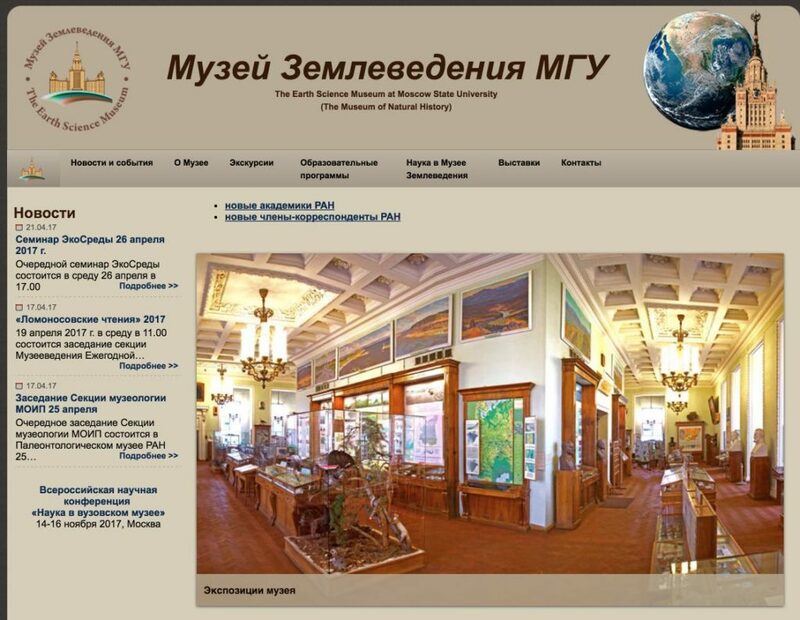 To finish, I can say that inside the main building of the Moscow State University you can find the Museum of Earth Sciences, located between the floors 24 to 31, and you can go out the terrace to have a fantastic panoramic view of Moscow. However, at present it is not open to the general public and it can only be visited by prior appointment, with groups of students from educational centers (schools, institutes, universities, etc.). One of the Seven Sisters to which it is possible to climb is the Hotel Ukraine, known today as the Radisson Royal Hotel, a five-star accommodation. The observation platform is located on the 33rd floor of the building, where there is also a cafeteria. The skyscraper is 198 meters high and has 34 floors. It is next to the Moskva River. Its construction started in 1947 and was completed in 1957, being the tallest hotel in the world until 1976. It is the second tallest building in Stalin’s skyscrapers after the main tower of Moscow State University. 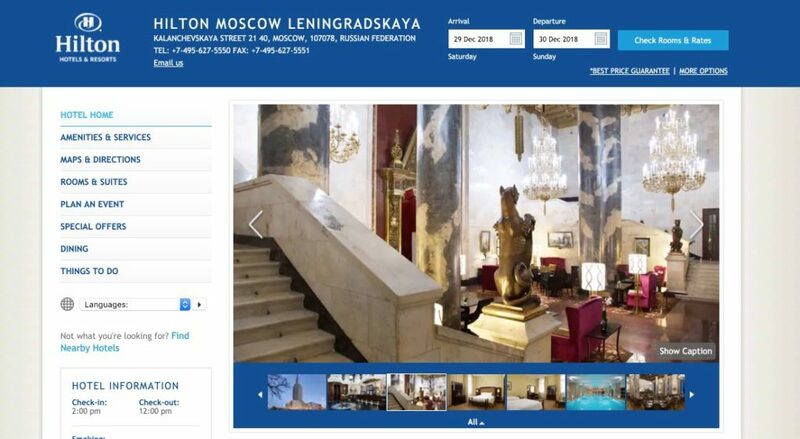 https://www.radissonblu.com/en/royalhotel-moscow (in Russian, English and German). It is one of the highest observation points of the Moscow capital, on the 33rd floor of the Hotel Ukraine (about 120 meters high), with privileged views of the city; you can see the golden domes of the Cathedral of Christ the Savior, the skyscrapers of the financial district of Moscow City, the Moskva River or the green areas of Vorobyovy Gory, among other impressive panoramic views. Free admission for hotel guests, for clients, hotel restaurants, for children under 6 years old and for holders of the Moscow City Pass. Admission with a price of 1,000 rubles for adults (includes a drink of your choice: mineral water, juice, tea or coffee), or 500 rubles for children from 6 to 14 years old. If you visit the Hotel Ukraine, don’t miss the diorama (or panoramic model) of Moscow, created in 1977 and which has become a sensation since its inception. It was taken to different countries: up to 40,000 people visited it daily in New York. It was purchased in 2007 by the Radisson Royal Hotel and restored. It shows the center of Moscow and more remote areas, with lighting and movement effects, as well as other numerous details. The painted area is 97.5 square meters. It is located in the hotel lobby and is free of charge. This skyscraper of 176 and 22 floors (17 usable) has a residential use. The central tower ends with an antenna and the facade is full of sculptures. The apartments were conceived for the Soviet elite of the time and it was completed in 1954. The building, which has more than 450 apartments, also includes a huge underground bunker for its tenants. It has a supermarket. It is known as “the house of the aviators”, since many of its inhabitants were pilots, astronauts or aeronautical engineers. As curious fact: the tallest floors were for the KGB and its listening devices, intended to spy on the nearby US embassy. In addition to the American Embassy, ​​the Moscow Zoo and the Planetarium are also close to this building, which are ideal visits if you are traveling with children. This colossal skyscraper, which is the only one of the Seven Sisters not crowned by a Soviet star, reaches 172 meters and it has 27 floors. It is located at the end of the well-known Arbat street and it contains the offices of the Ministry of Foreign Affairs. In the highest part of the facade there is a large shield or emblem of the Soviet Union, as well as the building of the Red Door Square, with an area of 144 square meters. The interiors are certainly luxurious. It is a public use building and can’t be visited by tourists, but it is worth seeing outside after touring Arbat Street. It is the smallest of the Seven Sisters, with the original name of Hotel Leningradskaya, which is 134 meters tall and has 26 floors. 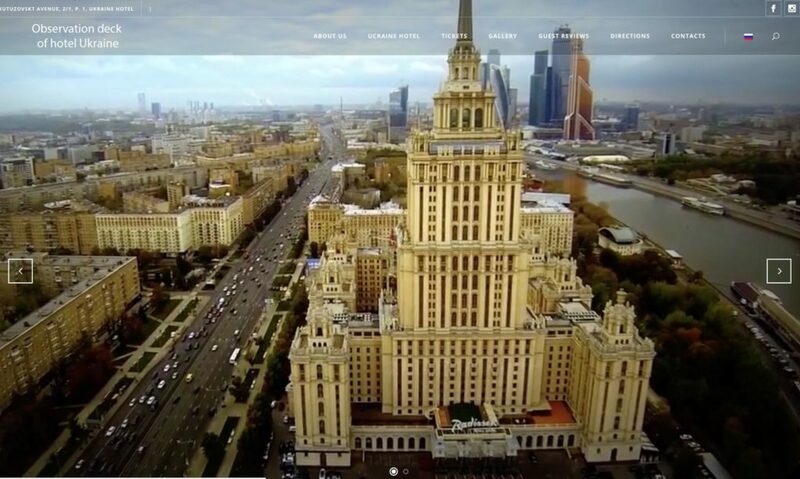 In 2008, with an investment of millions of dollars, it reopened as the luxurious five-star Hotel Hilton Moscow Leningradskaya, for the enjoyment of its customers. The lobby shows the best of Russian imperial art with imposing bronze statues, huge chandeliers and sumptuous furniture. At the entrance we also see a giant lamp, one of the largest in the world, which illuminates seven floors. The roof is made of wood carved by hand. You can stay in it. 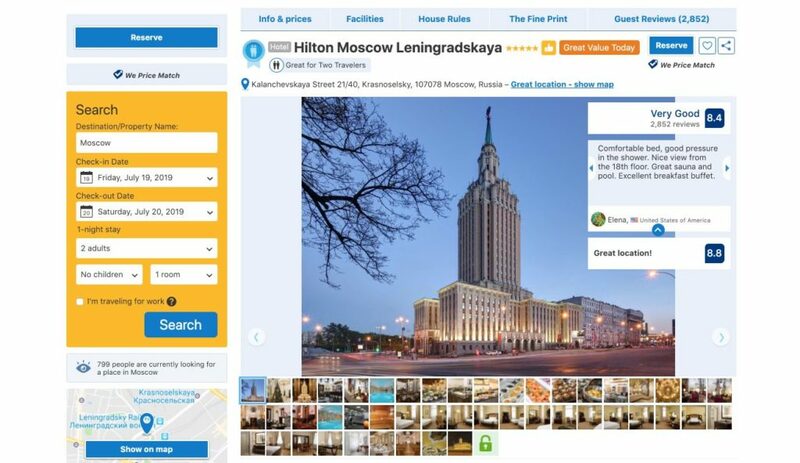 The reservation can be made through Hilton chain website, or the Booking platform where it usually has a better price. Despite being a 5-star hotel, it is reasonably priced (about 100 euros a standard double room). 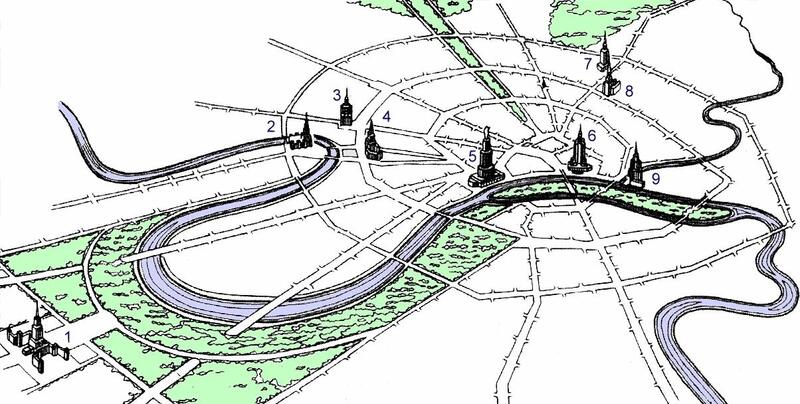 It is well connected to the center and right next to 3 train stations: Leningradsky (from where trains leave towards St. Petersburg, northwest Russia, Estonia and Finland), Kazansky (trains to Central Asia, Ryazan, Ufa, Samara and Novorossiysk) and Yaroslavsky (trains to Siberia, Far East of Russia, Mongolia and China). Its construction was completed in 1953, measuring 138 meters and having 24 floors. It was created to house the Ministry of Heavy Industries. In fact, today the main building is the headquarters to several administrative units, such as those of the Ministry of Transport, the Stock Exchange and other public institutions. It also has two residential buildings of 11 and 15 floors, with homes not as equipped as those of other skyscrapers. You can rent one of their apartments. A peculiarity of this skyscraper is that it has a metro station just below, which can be accessed by the ground floor of the building. With its 176 meters, it was the first of the Stalin Seven Sisters to be completed in 1952. 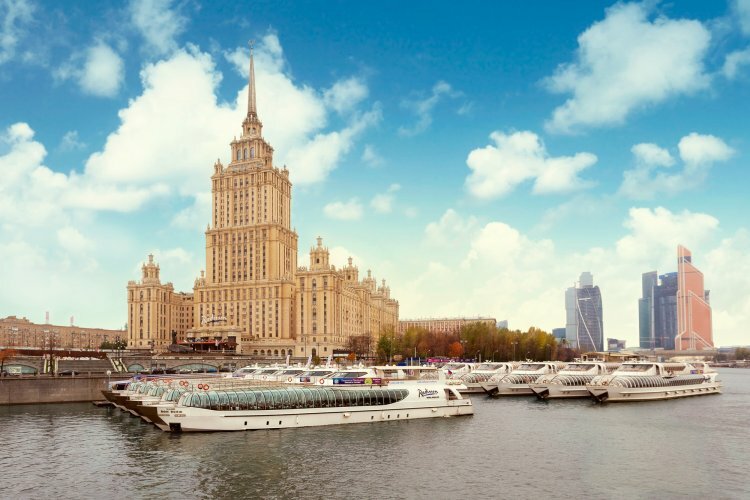 The majestic Kotelnicheskaya Embankment Building was designed for elite or luxury homes of people close to the regime, but soon after they were converted to multifamily units or communal apartments for families in need. Many celebrities also lived there. The skyscraper is located on the Kotelnicheskaya Embankment, hence its name, as it’s located on the banks of the Moskva River. In addition to having a residential use with its 700 apartments, it has several shopping locales and a movie theater. It is also worth taking a look at the facade, which faces to the Kremlin and houses numerous commemorative plaques of famous cultural figures. In this Youtube video, a boy shows us how he climbs dangerously up to the star at the top of this skyscraper (not suitable for those who suffer from vertigo). Of the Seven Sisters, this is the most centric of all, only a 15-20 minutes’ walk from Red Square. 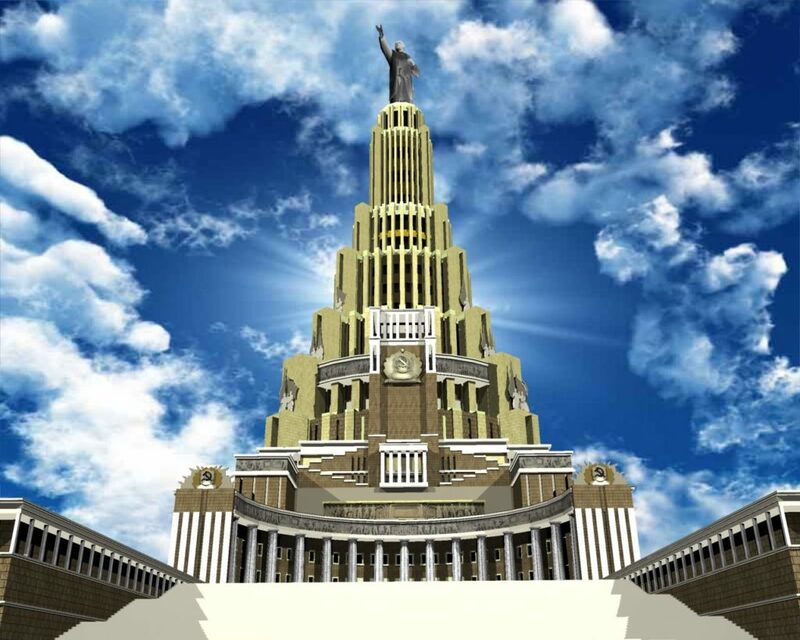 The Palace of the Soviets, one of the two unborn sisters, was going to be the biggest and most massive skyscraper conceived by Stalin for Moscow, with its projected height of 415 m, according to the final plans as well as a statue of Lenin at the top of another 100 meters. Its uses would be administrative, to hold congresses and celebrations. However, its construction was paralyzed at the beginning of the Second World War (1939-1945). In fact, the Cathedral of Christ the Saviour was demolished in 1931 to be erected in its place, and at the end of the 1930s, its foundations were laid. The German invasion of 1941 during the armed conflict paralyzed the works. Later, around 1960 and until the 90s, the so-called Moskva Pool, with hot water and huge dimensions, was located in the same place. It was open all year. 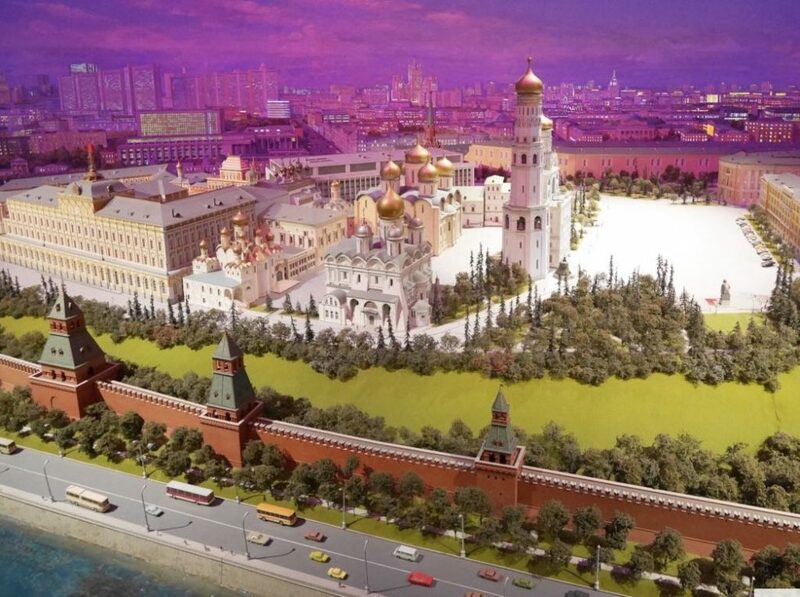 Then the pool disappeared and the Cathedral of Christ the Saviour began to be rebuilt again in 1994, becoming what it was in its historic place, one of the most important Orthodox temples in the country and the highest in the world. They also restored their impressive golden domes. It was going to have an auditorium inside with a capacity for 21,000 people. It was going to be the tallest building in the world, above all those of New York at the time. The rear pool was the largest outdoor pool ever seen, 129 meters in diameter. The statue of Lenin that would have crowned the mega-building would have weighed about 6 tons. For this, Stalin took over the aforementioned neighborhood. In all likelihood, Zaryadye’s skyscraper would have eclipsed, unfortunately, the famous urban and architectural ensemble around it. A few decades later, in the 60s and on the same site, the Rossiya Hotel was built, which was demolished in 2004. In the same space, Zarydadye Park was built in 2017, one of the best places in the world according to Time magazine. The Zarydaye Park, next to the Red Square, was inaugurated in 2017. It is already considered one of the best public spaces in the world, for its modern conception and use of the place. It occupies 78,000 square meters. 25,200 square meters are for the Zaryadye Concert Hall, a modern concert venue that stands out for its architecture. There is underground parking up to 430 cars. The first public park in Moscow after more than 50 years. It costed 480 million dollars. One of the main attractions of the park is the floating bridge over the Moksva river in the shape of a “V”. The panoramic views from there are unparalleled and also its functional and impressive architecture. The park also has a cinema and pavilions with the latest digital media, as well as a unique ice cave with interactive exhibition included. The Zarydaye Concert Hall has the Philharmonic, a multifunctional space for concerts in two rooms, one for 1,560 people and a smaller one with 400 seats. It also has an amphitheater for performances with a dazzling glass roof-facade and the most extraordinary state-of-the-art architecture. It is a translucent structure able to maintain a warm temperature also in winter. You can find more information on the website: https://www.zaryadyepark.ru/en/ (in Russian and English). Warsaw (Poland): The Palace of Culture and Science, built between 1952 and 1955, was a gift from Stalin or the Soviet Union to the Poles. In fact, it came to be named Joseph Stalin Palace of Culture and Science. It could even be considered the eighth sister, for the time it was built, for following the plans of the Zarydadye Building, though with modifications, and for its tremendous height: a total of 237 meters. Currently, its use is for offices and exhibition centers. Prague (Czech Republic): The Prague International Hotel opened in 1957, of only 88 meters high, but with very clear influences of the Seven Sisters. It has had different names. Bucharest (Romania): The House of the Free Press was a building completed in 1957, originally called Casa Scânteii (name of the official newspaper of the Romanian Communist Party), measuring 104 m including the television antenna. Kiev (Ukraine): The Hotel Ukraine was completed in 1961 and opened with the name of Hotel Moscow. It was completed without any pointed termination, crown, antenna or bell tower. Riga (Latvia): The Latvian Academy of Sciences was built in the 1950s but inaugurated in 1961. With 108 meters high, it was officially a gift from the workers and peasants of the USSR to Latvia. The Seven Sisters gave birth to a unique architectural style known as Stalinist architecture, socialist or Gothic Stalinist classicism, inspired by the skyscrapers of the United States but with its own features. Although Stalin’s skyscrapers were not built for urban planning purposes, but rather for propaganda purposes, after Stalin’s death, the government approved a decree condemning the architectural excesses and ending this unique style. 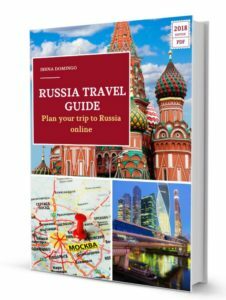 To finish, there are several agencies that carry out guided tours about the history of the Seven Sisters of Stalin, such as those that you can book from GetYourGuide platform. What do you think about Stalin’s Seven Sisters? Below you can leave your comments. If you found this article useful, you can help me by sharing it on your social networks. Thank you very much for reading me.